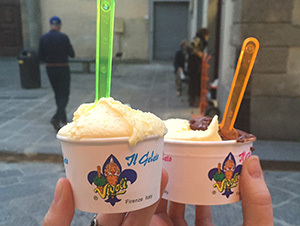 How did my granddaughter, Katie Cappeller, race through all those years to become a student at the University of Vermont, spending her second-semester junior year studying in Florence, one of the cultural centers of the universe? Road trip!¬ O.K. . . . Plane trip? Note to parents and grandparents: If your daughter /granddaughter is considering a semester in some exotic, adventurous, history-laden or cultural locale, encourage it. See why at the end of the article. 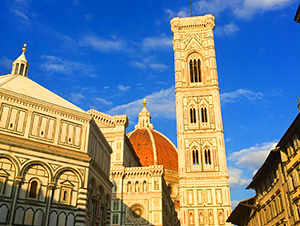 As soon as Katie had firmed up her plans to study in Florence, my wife, Candy; my daughter, Annie (Katie’s mother) and I went into serious trip-planning mode: comparing airfares, studying hotel choices, checking the ratings of Florence restaurants, ordering museum passes, etc. 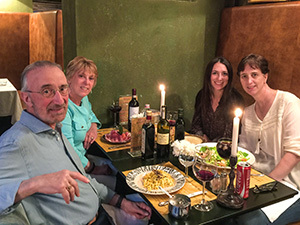 By the time of our eight-day visit, in early May, Katie had been in Florence for 3-1/2 months and knew where all the good stuff was . . . actually, where pretty much all of those alleyway-like vias and stradas led. Of course, she had classes to attend and homework to do, and she had done most of the museum, church and cathedral visits with classmates before we got there, so we had the earlier part of each weekday to ourselves but had dinners and the weekend with her. The Uffizi Gallery is the big museum attraction in Florence, with the operative word being “big.” Although not quite Louvre-size, it still can wear down your shoe leather and is often so packed with tourists you feel as if you are on a crowded subway car. Our three-day city museum passes were definitely a wise purchase, gaining us entry via the much shorter pre-purchase line. Despite the jostling crowds, masterpieces like Michelangelo’s “Holy Family with Infant and St. John the Baptist,” Botticelli’s “Birth of Venus,” and a room devoted to Da Vinci’s works make you forget the bustle all around as you marvel at such artistry. 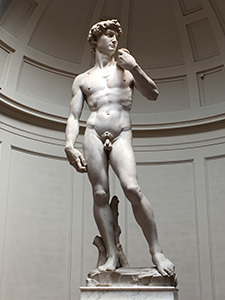 While there may seem some sense of obligation to say you have seen the world’s most famous sculpture, when you do stand staring up at Michelangelo’s David, at the Galleria dell’Accademia, you are nonetheless awestruck by how lifelike it appears. If it is mere mythology that the artist commanded some of his sculptures to walk, getting lost in a sense of the David’s anthropomorphism will have you wondering whether he does slip down from his perch and take a late night stroll in the quiet after the crowds are gone. Back to full-on cultural appreciation mode. Opposite the tomb of the great artist is that of Galileo, the great scientist. Not far from both: Machiavelli, the great political writer. Here Rossini, the great composer. There, a monument to Dante Alighieri, the incomparable poet (although Dante’s body lies in the Basilica de San Francesco in Ravenna). Ah, come on. What is this, the Cooperstown of great Italians? If one has a tendency to forget, all these sarcophagi become a dramatic reminder of the impact Italians have had on how the world thinks, listens and looks at itself. The basilica is filled with other tombs of the somewhat lesser-known, who themselves would form an impressive hall of fame. Nothing we experienced in Florence would alter that conclusion. To list the gastronomic winners we enjoyed would fill the rest of this narrative. Suffice it to say, from the homemade spaghetti with black truffles at Za-Za in Piazza Mercato Centrale to the pear-filled ravioli at Quattro Leoni on Via dei Vellutini, the huge bowl of mussels in garlic sauce at Osteria Santo Spirito in Piazza Santo Spirito, to the steaks with balsamic or blueberry sauce at Acqua Al 2, on Via della Vigna Vecchia . . . all molto, molto delicioso. And fine Tuscan wines to complement each. A word about owner/executive chef Stefano Innocenti at Acqua Al 2, a telling example of the emphasis Italian restaurateurs place on your not simply settling for something at their establishment, but truly enjoying the food. My wife, Candy, is allergic to onions, which Italian cuisine often includes. To be certain Candy enjoyed the full measure of his restaurant experience, Innocenti had a special sauce prepared for her homemade pasta. And, while the restaurant did not offer Candy’s tea with dessert, Innocenti nonetheless returned with a pot of hot water and . . . well, “I found some,” he said. Of course. Dining in Italy is nothing short of wish fulfillment. 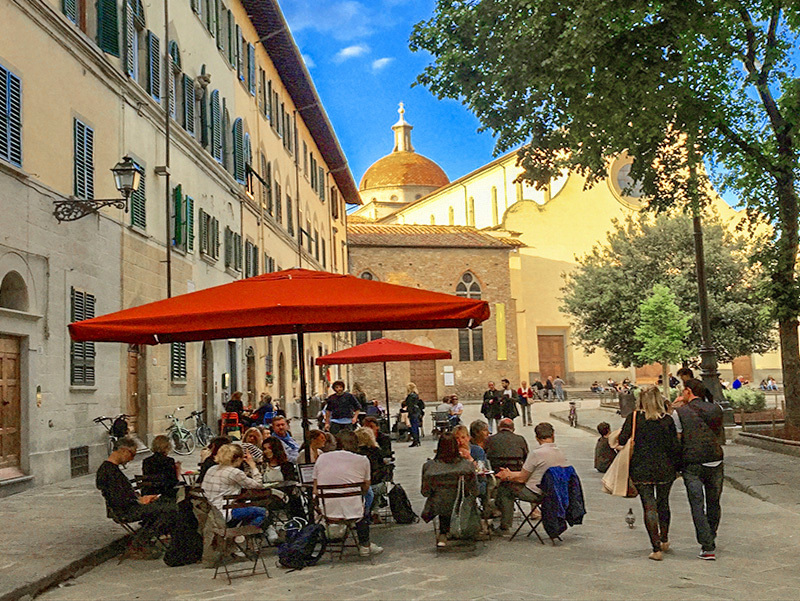 A wonderful diversion from the crowded streets of Florence is a tour of the Chianti region with Tuscan Wine Tours, part of a network of such tours by Grape Tours of Italy. We traveled about in a brand new SUV, large enough to comfortably seat the four of us and two young newly wed couples. 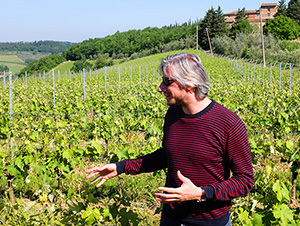 Our guide and wine expert, Bernardo Conticelli is a professional sommelier, spoke impeccable English, was a wealth of information on Tuscan wine production and the nuances in each of the wonderful reds and whites we tasted at the Poggio al Sole and Corzano e Paterno wineries. 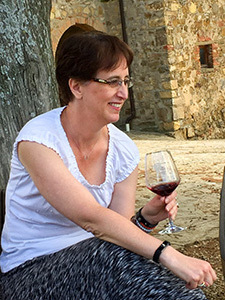 The wines tended to run in the €20 and up range, but buying a six-pack of exquisite Tuscan reds and shipping them back to the U.S. cost us about 40% less then the wines would have cost at high-end wine shops in our New York area. While business news has been reporting for years about the stagnant economies among E.U. countries, with Italy supposedly among the most suffering, it was hard to square that with the over-the-top shops of what seemed like every high-end fashion designer from Italy, France, the U.S. and U.K. You see them on block after block throughout the heart of the city. 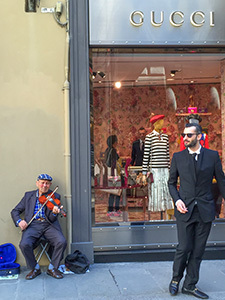 If you’d prefer to simply wait until you return home to buy your $4,000 Armani suit, $1,300 Ermenegildo Zegna sports jacket or $7,000 Valentino party dress, opt instead for something in fine Florentine leather. 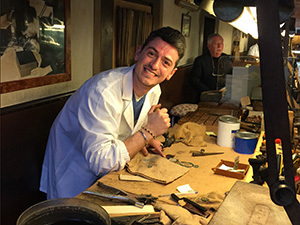 We bought a few items at the Scuola del Cuoio, leather school attached to the Basilica di Santa Croce. 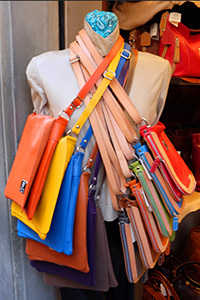 While there is no certainty the leather goods being hawked by street vendors weren’t faux leather made in the Far East, the boutiques selling everything from belts to all manner of leather bags will show you certificates of their Florentine origins. One other irresistible buy is the hand-painted paper. The proprietor at Il Papiro on Via di Scolivigne, created some beautifully colorful papers while we watched in amazement as the paints he dripped into a shimmering bath holding blank sheets swirled kaleidoscopically into dizzying patterns. Our base was Hotel la Scaletta on Via Guicciardini, centrally located just a few short blocks from the famed Ponte Vecchio. Typical of so many of the smaller, non-chain properties in Europe, la Scaletta has its interior design challenges. The reception area was on the third floor, 97 steps up, which precluded any thought of hauling suitcases up to the front desk. The elevator fit two people, or one person and a suitcase. The wiser choice was taking the elevator up, whereupon the desk clerks sent the porter to handle the bags. The room was a bit tight for three, but had comfortable beds, new bathroom fixtures, international stations on the TV, Internet access and was kept clean and tidy every day. Aside from its convenient location – we could walk to everywhere – the hotel’s other major asset was its two-story rooftop terrace, with absolutely killer views of the cityscape on one side and the Boboli Gardens on the other. Each view seemed an ephemeral painting in the changes of late afternoon light and shadow. The alfresco bar made the terrace near impossible to leave at the end of a day spent walking our feet off in this endlessly fascinating city. Note to parents and grandparents: If your daughter /granddaughter is considering a semester in some exotic, adventurous, history-laden or cultural locale, encourage it. It’s even cost effective. 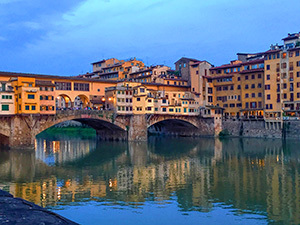 Katie’s semester in Florence cost less than it would have at UVM. Your grandchild will join more than 300,000 U.S. students who study abroad each year, according to the most recent statistics from the Institute of International Education. More than 50% choose study programs in Europe, 40% of those in the U.K., Italy, Spain, and France. Best estimates for boys versus girls taking part in these programs indicate an advantage favoring girls of about 10-1. No reliable reasons why. This makes me want to go back to Italy… and this coming from someone that I have just returned from Venice a few days ago. It makes me want to go back to Italy — and this coming from someone who left it only 3 days ago! Yes, Tony is a great writer, isn’t he?